Snrky: Appropriate, it is unknown territory. Appropriate, it is unknown territory. A surprisingly well-known phrase for something that was used once. I wish I wrote code that exhibited that sort of tenacity. What's the cat for? He's a lucky cat and anyone who has a roadmap with so little direction is in need of a bit of luck. And I didn't draw the cat, so I want to know what he says. I hope it's not obscene. Next time I'll erase his pictograms and replace them with binary. The only known historical use of this phrase is in the Latin form "HC SVNT DRACONES" (i.e. hic sunt dracones, here are dragons) on the Hunt-Lenox Globe (c. 1503–07). Earlier maps contain a variety of references to mythical and real creatures, but the Lenox Globe is the only known surviving map to bear this phrase. The term appeared on the Lenox Globe around the east coast of Asia, and might be related to the Komodo dragons in the Indonesian islands, tales of which were quite common throughout East Asia. Snarky: I've got the product road map. 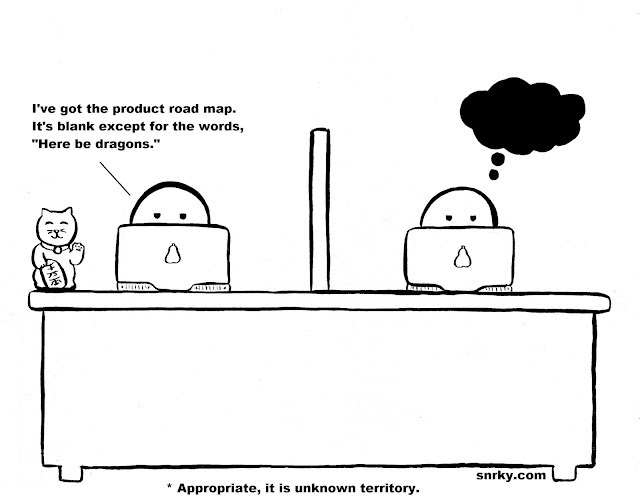 It's blank except for the words, "Here be dragons." Title: Appropriate, it is unknown territory.